We were talking to our friends David and Amanda, bandying around a few places we might want to go birding. Both David & Amanda have been keen on South America over a number of years, but as Judy and I tolerate long haul air travel only as a means to visit birding spots abroad, we limit it, only doing it when needs must. Costa Rica was such a place that had been mentioned, but looking at the travel time, plus the amount of internal travelling involved we have tended to put it in the file labelled “to do later ”. It was during one of these discussions that Trinidad & Tobago was suggested. I have to be honest and say that I was less than keen. It was not a destination I had ever considered. Jude on the other hand, who is far more circumspect than me, turned to the many birding brochures we receive each year and read up on the trips they offered. After a few hums and nods of approval it was suggested that I at least look at the reports before dismissing it out of hand. 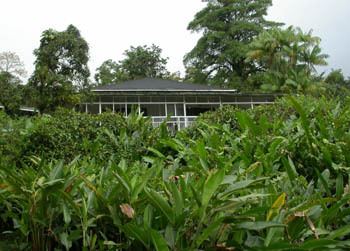 After reading the first report, I was sold; I was absolutely fascinated with the reports on the Asa Wright centre on Trinidad. I am ashamed to say that I had never heard of the centre which is described in all the brochures as the “World Famous Asa Wright Nature Centre”. A return call to David & Amanda a couple of days later saying “lets do it” took them completely by surprise, they were not expecting such a rapid response. David & Amanda ("the Gits") have the luxury of very early retirement, hence the nickname, so they kindly offered to take on the planning role and to come up with an itinerary and costs for the trip. This we readily accepted. Within a month we had received a fairly detailed draft itinerary and costings. We travelled by B/A from Gatwick to Tobago via Antigua on a Boeing 777 on the 16th of January arriving in Tobago 17:35 which included a 1 hour stop over in Antigua. The time differential is 4 hours behind UK time so our body clocks were saying 21:35. After the usual meeting and greeting we were shown to our room. 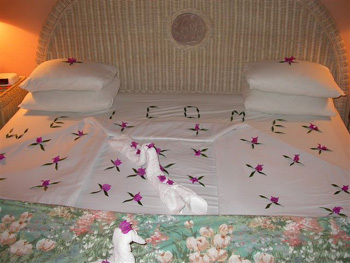 The Bed and Bathrooms were festooned with flowers and leaves all bidding us welcome to the Coco Reef Resort. A gesture that impressed Jude, although it wore a little thin with me when I had to clear a plastic shopping bag full of flowers and leaves in order to get some much needed kip. The hotel was comfortable enough with air conditioned bedrooms and all the facilities a 4/5 star resort tends to offer. Breakfast was self service with the typical array of cosmopolitan fare on offer. As we were birding we opted to stay bed & breakfast, taking our evening meals as and when required. We felt that the cost of eating in at the hotel was a tad exorbitant at approximately £40 per head which included a bottle of plonk. Several restaurants were within walking distance serving acceptable meals at reasonable prices. As is the same the world over there was a Chinese restaurant a 5 minute taxi ride away serving all the dishes we are familiar with at very reasonable prices.  This, we availed ourselves of on several occasions. Part of putting the holiday together included David engaging a local bird guide, this he did to great effect by hiring the services of Newton George. Newton is a man of many talents which used to include managing a national Tobago football team, taking him to countries where he met royalty as well as heads of state. His knowledge of the local fauna & flora was unsurpassed. His laugh and general jolly demeanour made Newton a pleasure to bird with. 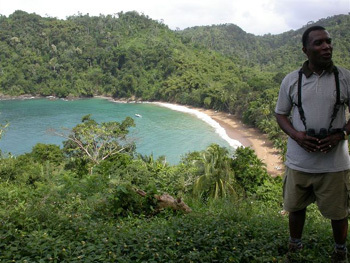 We would not hesitate recommending him as your guide on Trinidad. This site was just a few minutes from our hotel and probably my favourite birding spot on the Island. The lagoons at the water treatment works contained ducks, waders, herons and egrets whilst the ditches and marshes adjacent to Bon Accord Road held all the above, but with mature trees and palms hosting parrots, cuckoos, trogons and flycatchers etc. 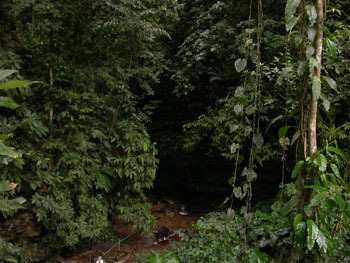 This is the last remaining tract of unspoilt rain forest left on Tobago. It's a favourite excursion spot for both birders and holidaymakers alike, with several licensed guides vying for custom at the entrance. The trails can be very muddy so stout footwear is the order of the day. For the less squeamish, wellies can be hired at the entrance for a couple of quid. Both Jude and I used our Jesus sandals, necessitating the cleaning of both footwear and feet on conclusion of the trip. 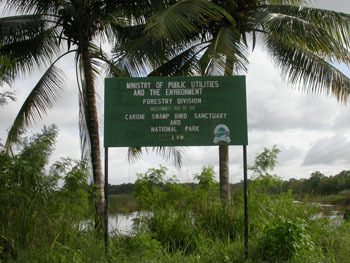 The site contains most of the forest birds which can be encountered on the island. 50> species should be a comfortable target for a day visit. This lies approximately a half hour's boat ride from the jetty at the Blue Waters Inn, which is situated in Speyside, a journey of approximately 1 and a half hours from Coco Reef. The Island itself is heavily wooded and the trails consist of steps which can be very steep as well as narrow trails which are also steep and overgrown in some parts. I would imagine they can become quite slippery after heavy rain. Bird sightings are restricted to 1 viewing point and nesting birds along the trails. We found that due to the humidity a change of top clothing would have been welcome. The trip is a must if you wish to see Boobys, Tropicbirds and Shearwaters up close. 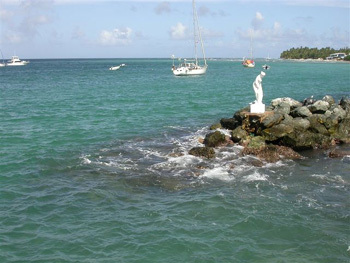 Newton's package included an excellent lunch at Jemma's Seafood Kitchen, and transportation by glass bottomed boat, affording great views of the coral reef. Although looking down whilst the boat skittered on the tide was not appreciated by all. All of these sites are covered in A Birdwatchers Guide to Trinidad & Tobago by William L Murphy ISBN 1 871104 11 4. It's not my intention to go into to much detail. 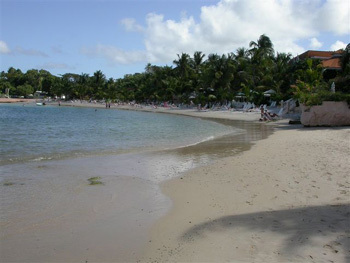 Other sites visited included Turtle Beach, Bloody Bay main road and Hilton Ponds and Pigeon Point. We also visited both the Adventure Farm at Plymouth and Grafton Bird Sanctuary. These are small commercial enterprises which use feeding stations to bring in the birds, so close up views can be had, especially for the budding David Baileys. Part of the Gilpin Forest excursion included lunch at the Cuffie River Nature Reserve. 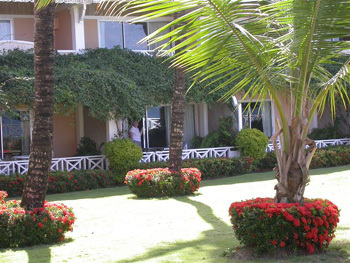 This impressed us with the quality of the accommodation, the food we received and the tranquil setting. If what you want is the above, and you don't need to be on the coast we would have no hesitation in recommending this as superb holiday accommodation. Tobago is the archetypal Caribbean Island, with clear azure waters containing coral reefs, palm fringed white sandy beaches and the types of resorts you'd expect. Although we had several heavy rain showers during our visit the weather was in the main, dry and sunny with daytime temperatures in the upper eighties. Night time temperatures remained in the mid seventies so air conditioned accommodation is preferable. The locals were friendly and the atmosphere was relaxed. We have no hesitation in recommending the island as both a holiday destination as well as a birding one. This is a great location if you have one partner who is a birder and one who is not. Great beaches to relax on, read a book, or just get that all over tan, together with all the water sports you can imagine. 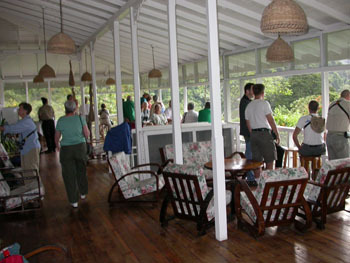 Our stay on Tobago produced 96 species of birds of which the great majority were lifers. The birds on Tobago seem to have that laid back Caribbean attitude to life, so we were able to get close up and personal with many of the species. 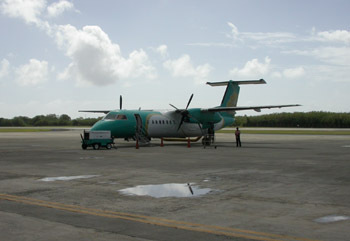 Trinidad is just a 15-20 minute flight depending on wind speed and direction. “So no in flight movie”! 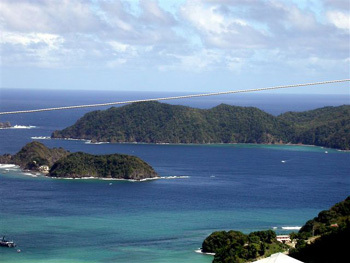 The Islands are so close in fact, that our guide on Tobago, Newton, runs day excursions to the Asa Wright Nature Centre on Trinidad. Several local carriers ply between the Islands and flights are fairly frequent and, just as importantly, cheap. Our flight was with Tobago Express and cost £18 each. This can vary according to the time you wish to fly. Flights of £12 are certainly possible. With only 16 passengers on our flight the usual luggage scramble at the carousel was non-existent and we were meeting our bird guide Dave within half hour of touchdown. Our journey to Asa Wright took about 1 hour; this included gridlock in the town of Arima. Streets swarming with people, cars impatiently honking their horns at every intersection, intermittent bursts of ear shattering reggae from local bars, a world away from what we had left on Tobago, and only a 20 minute flight away. Once out of the town we travelled for approximately 30 minutes along a poorly maintained narrow road which our guide Dave proclaimed had a bend for almost every day of the year. 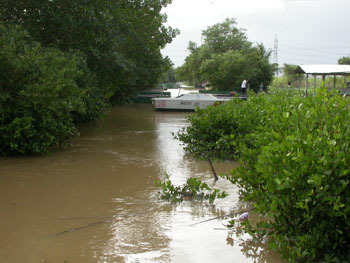 Heavy rain in 2005 had caused many major land-slips of which several were still in evidence. Blasts on the horn at almost every bend warned oncoming traffic we were approaching. The Asa Wright Nature Centre was accessed along another narrow road with the centre approximately half a mile off the main road. The approach road was dotted on both sides with exotic flowering trees and shrubs, each one being favoured as a preferred food source by the different hummingbirds, honeycreepers and trogons according to our guide Dave, all of which we would become so familiar with during our stay. It would be true to say that the main building including the famous veranda with its many feeders did not disappoint; neither did the staff, who were so accommodating and friendly. 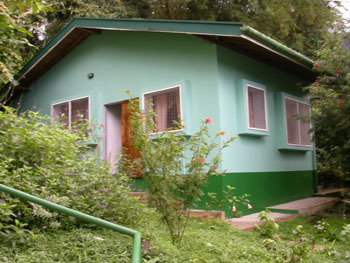 The various trip reports we had read had all described the accommodation as basic but clean. Disappointingly, the description we would use for our room is tired, very basic and initially not very clean, and it bore no resemblance to the light & airy room depicted in the Asa Wright brochure. Buffet style meals were taken in the splendid dining room, which had large tables, allowing for gregarious meal times, so meeting other like minded travellers was not a problem. Dinner, the main meal of the day, was a little repetitive. It consisted of mainly meat, usually served casserole style, although Tuna was served as an alternative on one occasion. Rice was the main accompaniment with an assortment of vegetables. No alternative was on offer unless you had special dietary needs, so if you didn't want the meat you had to content yourself with the rice, veg and finely sliced salad. The guest list comprised mainly of American birders who had the quaint custom of waiting outside the dining room for the dinner gong. They would then form a queue which stretched down the corridor. Each person would then take it in turn to avail themselves of starter and main course before finding a table, rather than the European way of, first find your table, then collect your starter etc, etc. I must say we found all of our American cousins very friendly and gregarious as you would expect. I have to admit to the odd chuckle behind the back of the hand at some of the exclamations uttered when a particularly brightly coloured bird came into view. The grounds and trails are extensive but be aware that Asa Wright is set on the side of a valley so not many walks are on the flat. Humidity is high as you would expect living in a rain forest and a strenuous half hour's walk along the trails will necessitate a change of clothing. 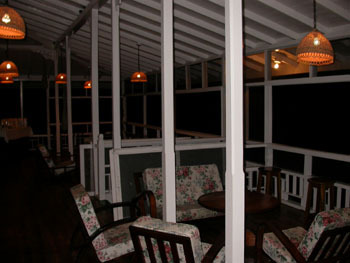 The Veranda is the focal point of the centre accessible from about 5:45am with coffee and tea available in insulated jugs. These are on the table that doubles up as the bar during the day. Incidentally this closed prior to the evening meal so any post meal drinks had to be obtained from the kitchen. Returning to the veranda; the early birds get the prime positions and also the spectacle of dozens of bats availing themselves of the fruit laid out on the feeders below. The veranda watching is as spectacular as described in the various brochures and trip reports. Something I was happy to do for hours. The centre is open to the public during the day, so visiting schools and tourists can make space on the veranda a premium. There are usually a couple of guides on duty on the veranda, giving detailed information on the many visiting birds, as well as the myriad of flowering shrubs. Each flowering shrub seemed to be controlled by a different variety of hummingbird that was prepared to repel intruders at all costs, rather strange when you consider the number of feeders dispensing copious amounts of nectar substitute. Our guide, who was supplied through Asa Wright, was Dave Ramlal. Dave was exclusively ours during our stay; he was an extremely knowledgeable naturalist, a job he has been doing for some 16 years. His hearing was astonishing, filtering out the calls of target birds amongst the clamour that is the rain forest. His enthusiasm and determination to produce the entire target species was admirable, as was his patience when pointing out birds in the canopy that aren't obvious to the untrained eye. 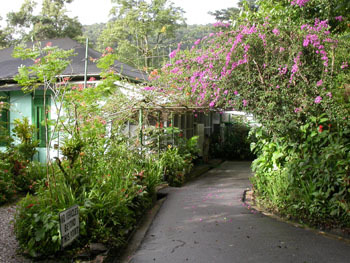 This is the road that leads from Arima town past Asa Wright and then on past the Radio Receiving Station and the site of Trinidad 's only endemic; the “Piping Guan”. I have to say at this point that this was not my favourite site, although my opinion may have been clouded (excuse the pun) by the low cloud and almost torrential rain that accompanied our visit. As you would expect in such conditions birds were rarer than hen's teeth, visibility was restricted, together with the constant battle of fogging bins and soggy necks. The birding was cut short just after lunch. After a change into dry clothes we returned to the comfort of the A/W veranda where we remained until the dinner gong was heard. This was probably my favourite site on the island and I was a little disappointed that we only visited once. The station consisted of fenced off savannah intersected by a track where Indian Buffalo were being crossed with Brahmin cattle to provide a beast that could thrive in the hot humid conditions and produce a lean tender meat. The site contained many small wet areas where waders, herons, egrets and jacanas could be seen. The odd raptor adorned the scattered trees, whilst small passerines fed on seed heads and insects disturbed by the cattle. Is a vast swamp on the east of the island: it starts just south of the village of Manzanilla and we viewed it by driving along the Manzanilla road as far as the Nariva River. The Manzanilla road runs between ocean and the swamp; a small area of scrub lies between the beach and the road acting as a buffer zone. Our birding consisted of stopping either when birds were spotted, or at points along the way that Dave knew held birds and scanning. It was a good area for raptors in particular, as well as birds you would generally associate with wetland habitats. Be aware that this is a busy road and because it is fairly straight, vehicles are upon you very quickly. I would have liked to have spent more time here but it was approximately a 1 and a half hour's drive from Asa Wright and with birding stops on the way, our time was reduced. Another great site for wetland birds, these rice fields are vast, with many areas of standing water. Herons, ducks, egrets, jacanas and bitterns abound, together with raptors, parrots and the usual suspects. Again we only visited the site once and I'm sure that one visit does not do justice to it. Probably our least favourite of all the sites we visited. Waller Fields is an old American air force base. It consisted of areas of scrubby under-story, with mature trees. We birded this area during daylight hours as well as at night. Night birding is essential if you wish to see nightjars, potoos, pauraques and Screech Owls. Again, lamping at night for such species is not a favourite of mine. The majority of views are of eyes shining in the lamp light, then the birds disappearing into the blackness. The site is also favoured by Red-bellied Macaws who feed on the date palms in the late afternoon. Not a site on our original itinerary, but one that can be thoroughly recommended, especially if you want to see hundreds and, I believe, even thousands of waders at the right time of the tide. Black Skimmer, Large-billed, Sandwich and Royal Terns, Hudsonian Whimbrel, Spotted, Semipalmated, Least, and Western Sandpipers, Willett, Lesser Yellowlegs, Grey Plover, Ruddy Turnstone, Laughing and Lesser Black-backed Gulls, herons and egrets were all on offer during our visit. Dunstan Cave is accessed through the grounds of the Asa Wright centre: it's a half hour's walk, descending for most of it's length, with steps and hand rails to aid in the steepest areas. Access is only allowed through official guided walks from the centre and is only available to guests staying for 3 nights or more. You have the opportunity to enter the cave via a boulder strewn stream, which was flowing fairly fast due to all the rain we had. Because of this, several of our party including Jude decided to obtain views from outside the cave. Having been in and then, enthusiastically relaying the experience to Jude, I convinced her to get her feet wet and enter the cave. It's difficult to explain the experience of entering the world of these birds, but it's an experience we will never forget and we implore others to do the same. This is the famous roost site of the Scarlet Ibis and a major attraction for both birders and non-birders alike. As a prelude to the main event, open boats seating approximately 25 punters each, take you along the narrow mangrove channels looking for herons, egrets, waders and potoos. I have to admit that a couple of hours glimpsing the odd bird amongst the mangroves, especially if you have to endure the odd heavy shower, ain't our favourite. Once moored in position the spectacle of several thousand Scarlet Ibis, herons and egrets must be one of the wonders of the ornithological world. We have to say that, if our guide Dave is to be believed, Trinidad is becoming lawless to the point of a dangerous destination to visit. Shootings, kidnappings and street crime happen on a daily basis. We were informed that the majority of crime is drug related. It is the first time that we have had to have bodyguards in attendance whilst we birded. It is Dave's belief, that it is just a matter of time before a tourist is either kidnapped or murdered and that will have a major impact on ecotourism and, just as importantly, his livelihood. 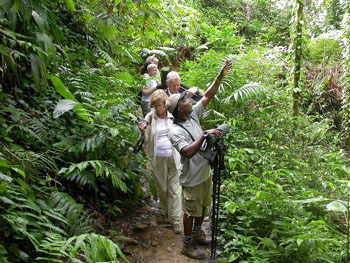 Our recommendation is, if you do go birding in Trinidad, ensure you do it with an organised group. It is fair to say that Trinidad did not strike us as a tourist destination. Although we spent very little time on the coast, where we did, the complexes were in the main either deserted or in a dilapidated state. The low point of the holiday was Amanda breaking her wrist. We have to take our hats off to Amanda's stoicism in being determined not to let it impact on her holiday. Judy, Amanda and myself jumping around like whirling Dervishes having alighted from the mini bus into a fire ants nest. Dave's (our guide) insistence of driving in the outside lane of every dual-carriageway whilst all the rest of the traffic undertook us, often speeding through a gap between a vehicle on the inside lane and ourselves. Newton's infectious laugh as we watched Frigate birds attacking the Tropicbirds and making them disgorge their food. Our pilot with LIAT Air, whose weight was estimated at between 30–35 stone. 36 hours of near torrential rain, and the unforgettable sound it makes on corrugated tin roofs. Asa Wright's inability to make contingencies for birding trips during times of heavy rain. Their policy appears to be “grin and bear it”. Returning to our room each day at Asa Wright to find “the Phantom Crapper” had struck again; beds including pillows, clothes and bathroom floors were not immune. We were assured that the culprit was a small gecko which lived in the room. All we will say on that, is that he shat the equivalent of twice his body weight daily. The outdoor Hindu cremation at the temple at Waterloo. 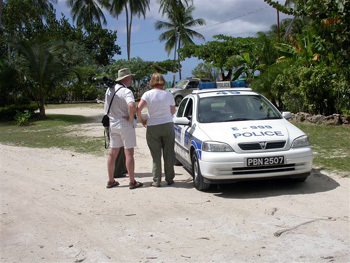 Judy, David & Amanda being touted, by the local police as birding guides, at Pigeon Point on Tobago.